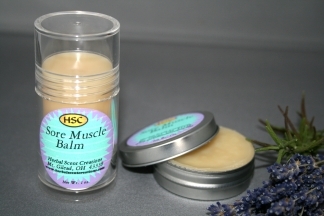 Relief for your tired, strained and overworked muscles and joints! Gently warming due to the cayenne pepper and ginger, this rub goes to work to relieve sore joints and muscles quickly while leaving a wonderfully calming aroma. Can also be used prior to physical activity to help eliminate strains. Available in tin or push up tube. Ingredients: solar infused oils of comfrey, rosemary and st. john's wort, castor oil, beeswax, extracts of cayenne, ginger and rosemary and essential oils. Net Wt. 1 oz.